Interview with European Union Delegation in Uganda Kristian Schmidt. During the Europe Day celebrations on May 9, you cautioned that "security doesn't come from a gun". It is perceived here that the gun has been/is a tool for keeping this gov't in power, on what premise were your comments? To be completely accurate, I believe I said we 'pray that Uganda remembers that ultimately security doesn't come from the gun' and the word 'ultimately' is important because we have to start by recognising that Uganda has been successful in securing its territorial integrity, in dealing with armed rebels, cattle rustlers in Karamoja and, of course, there is a violent history in the past as any other nation state, including in Europe. The gun has over the years helped nation states in asserting their legitimacy and control over the territory, so I am not a naïve pacifist. In Uganda's own narrative, there is peace and security both internally and in the region, so under those circumstances should feel safe and over time we have seen allocations to security go down. So that human security development comes from the gains the government has made. Of course, we are a bit concerned by the recurrent incidents such as Kasese and during the electoral period where security forces have gone too far. So, we simply encourage a move towards greater civilian control towards security and accountability, but in case of Kasese we have not seen that yet. Accountability helps you not to have any frozen conflicts and address issues at a go. First of all, it's important to note that accountability should not be to foreign diplomats. It should be to Parliament, to citizens and in the case of Kasese, Parliament did the right thing to launch a probe although it was stopped, whereas in case of the [presidential] handshake it was allowed. To me, Parliament is doing what it is supposed to be doing in any democratic society, asking tough questions. But that Kasese was off-limits, I think it is regrettable. Talk of democracy, you witnessed last year's General Election and several by-elections that followed, but notwithstanding findings by the EU Observer Mission, what would be your report card on our democracy? Well, first of all the EU recognises the outcomes of the last elections. The findings by our election mission are public knowledge and we feel and insist that elections fell short of national standards on a number of fronts. But if you ask me whether Uganda is a functional democracy, I will say yes although there are some trends which are worrying. Elections are one of the hallmarks of democracy according to the EU and US, but in many countries they are a double-edged sword. For instance, President Museveni here, some people feel he should be retiring but he claims people still want him. There is Robert Mugabe and other leaders who clearly don't want to go. Don't you think this renders elections useless in the definition of democracy? Elections are just as important as what happens between them. An election will declare a winner but what happens to the loser is also very important because at times the minority or the opposition have to challenge the aspirations of the people who voted for what they believed in. If the majority party captures the state as its own private property, not just for political power, but also for economic power to the extent that all institutions of the state are now serving the interests of the party that won the election, then you have a problem. It's not the problem of the election itself but of how the system is supposed to work: that the state is supposed to serve the interests of those who did not win the elections. This is why we have said that after the election panic why not then have a national dialogue. Not really because Uganda needs a coalition government but rather government and the Opposition sitting together and talking about the common challenges the country is facing such as service delivery or corruption - and leave the politics aside - basically the country coming together on the common interests. I think elections are important for stability, but they also give people a chance to assess if the processes of keeping people in power are legitimate. And frankly, if you take a very long perspective, the quality of elections in Uganda is certainly improving. Our election mission report focused on the absence of a level playing field, but showed that the quality is certainly improving and we made recommendations on how we see and what needs to be done. In fact, one thing I have learnt here is one should be careful when describing democracy and I am not here to advocate for a specific model. One thing the President said in one of our discussions, and I believe he has a point, is that leaders in Europe are managing democracies - existing systems - but Uganda is still creating one, and I do understand where he is coming from. What are some of the points of departure in your discussions with government? Honestly, nothing really comes to mind. Even on the heated issue of electoral reforms, abolition of death penalty or anti-homosexuality law, I don't think there was a moment where we said this is going nowhere or cannot see eye to eye again. The nature of our dialogues always showed there will be some change. In your May 9 speech, you further made mention of the election of young blood in France, president Emmanuel Macron, which proximately struck chord with the ongoing talk of tinkering with the Constitution to remove the age limit. What is your reading on the environment? First of all, it is the sovereign right of every country to amend its Constitution, and the fact is countries have different models. You will find European countries that don't have term limits or age limits, but there are countries in Africa that have the two and respect them, and are doing well. There is no official proposal in Uganda right now to amend the Constitution or to lift the age limit so at this time, I cannot comment about it. While it is true that some countries neither have term nor age limits, several have seen governments change, at least since 1986, and leaders know when to leave without being shoved. But that's not the case here. I think what is key is not a particular age or terms, what is key is that wherever you have presidential elections there should be a level playing field so that everybody has a shot. Term limits is one way of saying 'there is too much advantage for the incumbent, let us minimise the risk', but if you could level the playing field in any way, you don't need term limits. In the US, for example, there are term limits because given the power of the office, the ability to mobilise funding and presidential control of the machinery is such that after two terms the incumbent is simply too strong, but if you can legislate that even after four terms the incumbent starts on the same line with all others, with the same resources and without any due advantage, I think you don't need term limits. But where this level playing field cannot be guaranteed, I think we need term limits. That is not true at all. We don't have power of influence to keep anyone in power, either for or against. Power lies with the people of Uganda as elsewhere. We don't vote here, we don't hack into your systems and we don't influence anyone. What is true though is we appreciate the partnership with Uganda. Yes, it is true with President Museveni, as an important partner in fighting sectarianism, in dealing with Somalia and all that, but I don't think Uganda is doing that on our behalf. Uganda has real significant interests in the stability of the region. Uganda and Europe are acting together, not acting on our behalf. In refugee hosting districts in West Nile, the breadth of absolute poverty and neglect is written all over and makes you wonder why a government that cannot take care of its own, can be too kind to others. Is it about doing a thing a two that pleases you? The poverty is indeed a tragedy, but it is not true we influence Uganda on anything like on its hospitality. After three-and-a-half years here, I am convinced that hospitality comes from your own values. It's true the borders are artificial and the languages are the same, but I believe that hospitality is a truly Ugandan asset. In fact, Uganda is the first country to implement the New York Declaration, which the leaders signed at the UN, and for us we are just supporting you because we believe it's the right thing to do. Uganda had hoped to collect $2b (about Shs7 trillion) which came short by $1.6b, and I remember speaker after speaker called for an urgent end to the war. The lukewarm response also showed that countries were tired of this humanitarian funding. Where does that leave Uganda? I believe you did see European support, and 82 per cent in pledges came from us and we would have welcomed more competition from the non-traditional donors. But you are absolutely right, like commissioner [Christos] Stylianides pointed out, it's not enough to be meeting here to raise funding while neglecting the root cause of the conflict. The EU has imposed an arms embargo, and we keep wondering why the same has failed at the UN level. To the economic front, as of last year trade between Uganda and the EU averaged $958m (Shs3.4 trillion). What were some of the enabling factors? Well, the EU market has remained open with no tariffs or quotas since 2001. Of course, the European market is doing better now; we have fully recovered from economic crisis that started in 2008, and you can see the growth has eventually returned. We are a juicy market, you can say that. The exports from Uganda are although, still very traditional and their value fluctuates now and then. What would really make a difference is to ensure that Ugandan products are branded and quality is ensured. Are you satisfied with the level of absorption of the funds/aid you sink in Uganda? Yes, we are and I am. My expectation is not that nothing is delayed if say we are building a road; our expectation is about service delivery and demanding accountability. 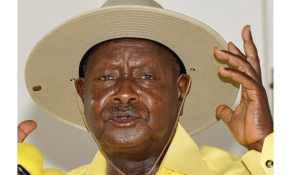 You leave behind the unresolved issue of the Economic Partnerships Agreement (EPAs) and at the last EAC summit, President Museveni was designated the chief negotiator with Brussels. As he prepares for the task, what will be the talking point? We welcome Uganda's continuing support for the EPAs. The Trade minister and everyone else has always agreed they were negotiated in the interest of East Africa, and Uganda is fully to sign, notwithstanding that Tanzania is not yet convinced to sign. The issues that Tanzania raises have not been clarified in a formal manner. I believe for the issues that are raised, the answers are in the region. We believe the EPAs are an outstanding future to log into the EU market and that offer is on the table for you to take. Three and half years in Uganda, what are you impressions? I loved it. I had a great time. I applied to come here and I have no regrets. It has been exciting, meaningful and dialoguing with almost everyone from the President, to MPs, technical people, inmates on death row, to the farmer in Karamoja. I am proud on behalf the European taxpayer. I think the warmth and kindness of the people. Uganda is amazingly a welcoming country. What were some of the highlights of your stay? At the professional level, I think the ability of having frank discussions with people in government, though not every time we agreed, and the ability to lead my colleagues of the EU member states. At a personal level, engaging with people on death row, refugees, women, former child mothers of the LRA war, among others, were some of those moments that truly tell the soul of a country. Not really. And like I said, I have no regrets, except for areas where we want to see some change like implementation of electoral reforms, not just by the EU Observer Mission, but also by the Supreme Court.